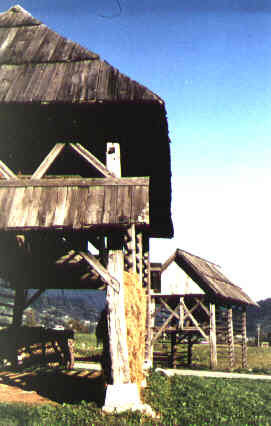 The kozolec (hayrack) is a free standing, permanent, mainly wooden, vertical, open but roofed device for drying and storing the goods: hay and grain. It is the only ethnical architecture I know: it exists exclusively in ethnical territory of Slovenian nation. The use of the hayrack: at first, it was used for storing grain (food for the people), and later, for storing fodder (for animals only). Today, due to the introduction of cheaper technology, it is only a remnant of former times. The form of the hayrack depends on its function. On steep slopes hayracks are single stretched ones, with supports, if necessary. They can be found on plains, too, where they consist of many "windows". Further away from homes and in places where it often rains, they have a projecting roof attached to one "window" for the protection of carts and people from sudden downpours. Double stretched hayracks are built when windy conditions create a need for additional stability. Their main function is storage and they are generally more useful than the single stretched ones. There are two types of double linked hayracks: one can be found to the north of the Sava river, and the other to the south of it. They differ only in the proportions and in the size of their fronts. The order that defines the hayrack is the golden section, which is closest to man's concept of beauty, and is in harmony with the surroundings. The order is vital for the uniformity of constructions. The complex base of the golden section is simplified to the maximum with the help of a square and its diagonal. The principle of construction is actually a visual presentation of the construction of the hayrack, seen from the front. The method of building as well, is simplified to the maximum by the use of a simple square. For this reason, examples of deviation from the ideal proportions are almost never found. Under this title you can find some good pictures.